This famous Kangal Hot Springs are 96 km from Sivas via the town of Kangal or 13 km from the center of Kangal itself. These thermal springs come from five different sources and the fish come directly from the springs into two large pools. 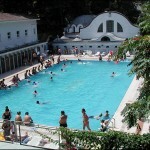 The thermal water flows at a rate of 40 liters per second with a daily capacity of 5.760 peple. The thermal water is 36 °C with a pH of 7.3 and contains bicarbonate, calcium, magnesium sulfate, chlorine, sodium and magnesium. Carbon dioxide gas is also present and is crucial in curing skin diseases, rheumatism, and neurological disorders. The fish present in the water simply draw out the diseased areas in a curettagelike fashion. 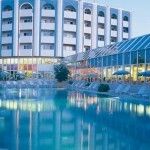 Many doctors and clinics throughout Turkey have recommended that their patients try the Kangal thermal waters as a cure. 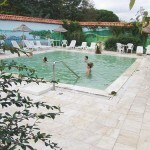 The thermal water is 46-54 °C with a pH of 6.8 and flows at a rate of 70 lit/sec. The spring water is beneficial to those suffering from rheumatism, nervous and respiratory disorders, digestive and metabolism complaints, liver, urinary, heart and blood circulatory problems. 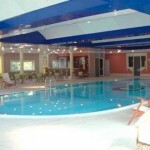 There are a total of 152 rooms with 361 bed capacity.